The French so planned the excavation that after the removal of the peak of the divide and lesser summits they could work a number of excavators simultaneously at several points, so that a succession of benches resulted, lying one above the other, each with the natural surface as the point of beginning. By working in the direction of the length of the cut, the face of the bank gives the longest cutting possible, reduces the number of times the excavator must be hauled back, and secures a satisfactory drainage arrangement, since the cutting is carried up grade on either side of the summit. The Americans have followed this same method, the only difference being in the character of machinery used. The width of the channel adopted by the French was 74 feet; the present plan is for a channel 300 feet at the bottom, so that the first work undertaken by the Americans was directed to securing the necessary widths for the upper reaches before attempting any increase in depth. Whatever water entered from rains and seepage was drained from the summit of the cutting by gravity to the Rio Grande on the south and to the Chagres River on the north. As shovels in excess of those required for widening became available, they were put to work to secure increase depth, care being taken to maintain, as far as possible, free, easy, and rapid drainage. Shovels are started at either end and carried towards each other, cutting out at a new summit. These pioneer shovels on the next lower grade make the "pilot cuts," which constitute the new drains and to which water is led by laterals from various parts of the excavated area adjacent. The average grade or slope is about 36 feet per mile. The loading tracks for these shovels are on the level above. When the "pilot cut" has progressed sufficiently far, its cut or trench becomes the loading track for a second shovel, which is started to widen out the cut already made by the pioneer, and so the work moves forward, the shovels, approaching the summit from either direction in echelon. In 1904 the summit of the excavation was at Gold Hill and at reference 193 above sea-level. the summit at present is between Empire and Culebra and is at reference 106 above sea-level. The drainage to the south is still by gravity, through the old bed of the Rio Grande to the west of the Pedro Miguel locks. It is expected that before the next wet season the center culvert of the locks will be utilized. On the north side conditions are now different. The reference of the low-water surface of the Chagres is 43 at the point of its intersection with the center line of the canal. The bottom of the completed canal is at reference 40. A dike separates the cut from the Chagres, but this is overtopped during the high floods. To get rid of the accumulated flood water, 24-inch pipes are laid through the dike, each with a suitable valve, and so arranged that all water above the pipes is carried into the Chagres by gravity and after the subsidence of any flood. Recourse must be had to pumping whatever water remains from the floods below this level, and such as may be collected by drainage from the south; for this purpose a sump has been dug to elevation 32 and pumps installed. It is not possible to estimate the quantity of water that will have to be handled, but three pumps are in place, each capable of discharging 12,000 gallons of water per minute. The greatest difficulty encountered in the excavation is due to slides and breaks, which cause large masses of material to slide or move into the excavated area, closing off the drainage, upsetting steam shovels, and tearing up the tracks. The term "slide" is applied to the movement of the overlying clay upon smooth, sloping surfaces of rock or other material harder than the clay. "Breaks" occur at points where the underlying rock is of poor quality, intersected by vertical seams or seams slopping toward the canal, and which is unable to bear up the superimposed mass. Generally, the upper surface of the broken portion of the bank remains approximately horizontal, settling nearly vertically. the weight of the broken portion forces p and displaces laterally the material lying directly below it in the bottom or on the berms of the canal. As the material thus forced up is taken away the upper part gradually settles and moves toward the axis of the canal until the entire broken portion is removed. The greatest slide is at Cucaracha, and gave trouble when the French first began cutting, in 1884, and still continues. Though at first confined to a length of 800 feet, measured along the line of excavation, the slide has extended to include the entire basin south of Gold Hill or for a length of about 3,000 feet. The original slide covered an area of about six acres, but the latest surveys show that it has extended to cover 47 acres. There are all told nine "slides" and "breaks" to be reckoned with, and there is nothing to do but to remove all the material embraced within their limits. As the cut is deepened these may be aggravated or others may develop. There is no method known to stop or to prevent them. Usually the first indication received, if there be a forewarning, is the lifting or moving of a shovel and tracks. The cut has therefore developed into the uncertain and experimental feature of the work and its completion will mark the date of finishing the canal. No apprehension is felt because of the slides after the completion of the work. They develop as the depth of the cut increases, and the banks slide or break because of the condition of unstable equilibrium that results from the cutting; when grade is reached equilibrium will be established, and the back pressure of the water will result in greater stability. Whatever slides occur subsequently will be relatively small, and the material can be easily handled by steam shovels on the berms that will be left and by dredges that will be available. Some idea of the magnitude of the slides can be obtained from the fact that during the fiscal year 1908, of 14,325,876 cubic yards removed, 884,530 cubic yards, or 6 per cent, were from slides. For the fiscal year 1910, of 14,921,750 cubic yards that were removed, 2,649,000, or 18 per cent, were from slides or breaks that had previously existed or that had developed during the year. Except for the slides, which are of earth, the material to be removed is rock, and requires blasting to enable the shovels to handle it expeditiously. The largest part of the drilling is done by churn or well drills, though tripod drills replace them where the others cannot be used to advantage. The drills are operated by compressed air, supplied by three compressor plants, which are connected together by a 10-inch pipe line about five miles long, with 6-inch and 4-inch leads running into the cut. The drills operate in batteries of from 4 to 12; the holes, from 15 to 27 feet in depth, are spaced from 6 to 16 feet apart. The explosive used is dynamite, 45 per cent to 60 per cent nitro-glycerine. Excessive moisture and water in the holes prevent the use of blasting powder. When the holes in any section are ready for blasting, they are "sprung"that is, four to six sticks of dynamite are lowered to the bottom and explodedthereby forming a chamber for the reception of the charge. The charges vary from 25 to 200 pounds, depending upon the local conditions; the tamping follows, and the explosion is effected by an electric current from one of the lighting plants. Through the blasted area the steam shovel cuts its way, averaging 34 feet wide at the bottom and 50 feet at the top for the "pilot cuts," which are 8 to 12 feet deep. The Widening cuts are about 26 feet wide and from 15 to 24 feet deep. The best results are secured with the 95-ton shovels though the 45-ton and 70-ton shovels are also used. The 95-ton shovels have dippers of four and five yard capacities, the former removing rocks containing as much as six cubic yards. When the rocks are too large to be lifted by the shovel, they are "dobie" blasted, and thus broken to sizes convenient for the dipper. This is done by placing three or more sticks of dynamite on the rock, covering them with mud and igniting by means of a slow match. The shovels load the material on dirt trains, consisting of 20 flat cars and from 25 to 35 steel side dumps to a train. The available dump grounds in the vicinity of the cut were utilized to their fullest capacity by the French and during the earlier periods of American control, so that longer hauls are necessary. The new line of the Panama Railroad, being above the lake level, requires many heavy embankments, which offer suitable places for depositing material. The breakwater from Balboa to Naos Island offers a dump, though requiring an average haul of 11 miles. As difficulty is experienced in extending this breakwater, additional dump tracks are provided at Balboa, so as not to delay the trains, and land at the inner end of the breakwater is being reclaimed; already 253 acres have been filled in. The interior swamps in the vicinity of Ancon are also to be filled. From 16 to 22 trains of material are sent daily to Gatun, average haul of 25 miles, and used in building up the toes of the dam or for large rock to place in the concrete. The remainder of the excavated material is wasted on extensive dumps at Miraflores. A large dump ground at Tabernilla was used, but is abandoned for the present. The Lidgerwood flats are dumped at Miraflores, Balboa, and on the relocated line of the Panama Railroad, where special equipment is kept to handle them, consisting of plows, unloaders, spreaders, and track-shifters. The plow is attached to one end of the train, and the unloader, consisting of a steam-driven drum on which is wound the cable, at the other end. To stretch the cable, the train passes between two uprights to which the cable is attached temporarily, and by moving the train the cable is drawn from the drum to the plow to which the end of the cable is attached. Winding the cable on the drum draws the plow the length of the train, removing the load. The steel dump-cars require no special or extra appliance for their operation, and can be dumped as easily on curved as on straight track. They also dump to either side. Work has been in progress on the Culebra Cut since 1880, and during the French control 18,646,000 cubic yards were removed. Between Gatun and Bas Obispo, the northern end of Culebra Cut, the French excavation which is useful to the present project amounted to 2,201,000 cubic yards, or a total in the Central Division of over 20,000,000 cubic yards. The total estimated amount of material to be excavated from May 4, 1904, in this division was 97,125,018 cubic yards, of which, up to January 1, 1911, 67,792,855 cubic yards have been removed, or 69.7 per cent. 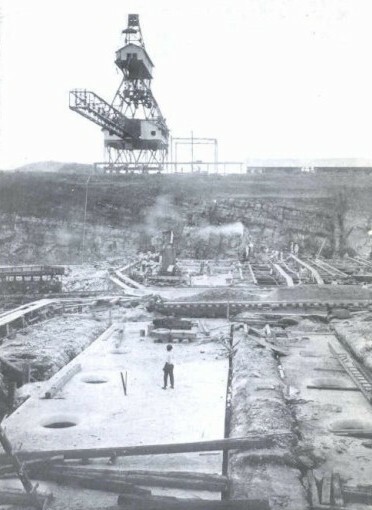 It is expected that all the excavation in the lake section will be finished by July 1, 1911. Some idea of the magnitude of the operations may be formed from the fact that this division has within its jurisdiction over 200 miles of 5-foot-gauge track laid, about 55 miles of which are within the side slopes of the Culebra Cut alone. An earth dam across the Chagres at Gatun impounds the water of the river and creates the lake which constitutes the summit level. The dam is 7,500 feet long over all, measured along the top, and according to the latest profile, it is 2,100 feet wide at the base, 398 feet through at the water surface, reference 85, and 100 feet wide at the top, which is 115 feet above sea-level. It crosses two valleys separated by a hill rising to elevation 110, in which the regulating works are being constructed. Of the total length of the dam, only 500 feet will be exposed to the maximum head of 85 feet, the remainder to less. The dimensions of the dam have been criticised as excessive and unwarranted, but its designers considered it desirable, in view of the amount of material available, that ample provisions be made against every force which may affect its safety, and that a barrier be made so that the layman without engineering knowledge would recognize its stability. Now that the dam is assuming appreciable proportions, this latter object is more than realized. The dam in plan is a broken line to conform to the configurations of the natural surface, thereby materially reducing the fill. It extends from the hill in which the locks are to be constructed to Spillway Hill, thence along the spur or hog-back of the hill on the west side of the valley (see map). The adoption of the earth dam brought on such criticism that an exhaustive examination of the foundations was made in order to determine more carefully the character and extent of the various underlying materials; to ascertain whether there was any possible connection between the swamp areas to the north and south through the deposits in the gorges across which the dam will be built; for testing the ability of the material to support the proposed structures, and for learning whether suitable material for the dam could be obtained in the immediate vicinity. As the result of the investigations, it may be briefly stated that the underlying material is impervious to water; that it possesses ample strength to uphold the structure that will be placed upon it, and, the subsoil being impervious, that there is no connection between the swamps above and the sea below. Because of the sluggish current of the river in the vicinity of Gatun and above, the deposits consist of the finer sands and silts interspersed with beds of clay. By constructing experimental dams of this material and subjecting them to the full head of water, it was conclusively demonstrated that this material is suitable for the interior or the impervious core. The dam is constructed by forming two dumps on the outer lines of the structure and depositing waste material, mostly rock, obtained from Culebra, the lock site, and Mindi. The area between the piles thus formed is filled with the material pumped in by hydraulic dredges, the natural surface of the ground having been previously cleared of vegetation and a suitable bonding trench excavated. Fluctuations in the lake due to floods are to be controlled by regulating works constructed in Spillway Hill. Objections were made to constructing such works in the line of the dam, but because of the natural configuration of the ground, irrespective of the location of the spillway, provision had to be made for typing the dam to the sides of the hill; moreover, the extent and elevation of the hill, as well as the material composing it, make it a suitable and desirable place for the waste weirs. The channel has been cut, the floor and side walls of concrete completed, and the Chagres River now discharges through it. As the reference of the floor is at 10 feet above sea-level, the lake is already formed at least to this height. The dam is to contain 21,145,031 cubic yards of material. On January 1, 1911, there had been placed 12,001,592 cubic yards, making 56.72 per cent of the dam complete. The spillway will contain an estimated quantity of 225,485 cubic yards, or 50.23 per cent, were completed on January 1. The locks are in pairs, so that if any lock is out of service navigation will not be interrupted. Thus, also, when all the locks are in use, the passage of shipping will be expedited by using one set of locks for the ascent and the other for descent. The locks are 110 feet wide and have usable lengths of 1,000 feet. The middle or separating wall contains a single culvert of the same area as the culverts in the side walls, which feeds in both directions through laterals controlled by valves designed to operate against a head from either direction. This arrangement permits communication between the chambers of twin locks, so that water may be passed from one lock to the other of the pair, effecting a saving of water. The main culverts are controlled by Stoney valves, and the laterals leading from the center wall by cylindrical valves. Assuming a difference of head of 30 feet, it is estimated that the entire lock can be filled or emptied using one culvert in 15 minutes and 42 seconds, and in 7 minutes and 51 seconds when both culverts are used. The lock gates are of the mitering type, double leaf, straight gates, varying in height from 45 feet 7 inches to 79 feet; the length of each leaf is bout 65 feet. A contract has been entered into for furnishing the steel for the gates and for their erection in place by June 1, 1913. To meet this condition, it is necessary that the concrete work shall be completed in time to enable the contractors to begin the erection of the various sets of gates on the dates specified in their contract, and the work is being prosecuted with this end in view. 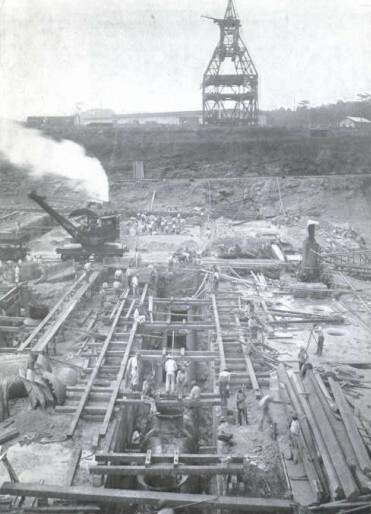 To accomplish the result, the concrete for the Gatun locks must be finished by June 1, 1912, and that for the locks on the Pacific side by October of the same year. It has been accepted as a fundamental feature of the design that at each flight of locks there must always be two barriers separating the high level from the level next below. To carry this out, two sets of mitering gates are placed at the upper and two at the lower end of each of the uppermost locks in each flight. In addition a chain device is used to guard the barrier gages against accident, and so controlled as to be capable of checking a ship of 10,000 tons moving at the rate of about five miles an hour. More than 95 per cent of the vessels navigating the high seas are less than 600 feet in length, and this has been taken as the determining factor for the location of the intermediate gates, which are introduced in the design to save both time and water. For the protection of the intermediate gates against vessels using a smaller length of chamber of chain barrier is to be installed. Guide piers are provided both up-stream and down, to which vessels will tie before entering the locks. Designs for electric towing machines are being prepared, which will be used for towing vessels into and controlling their passage through the locks by means of lines or cables attached to what may be considered the four corners of the ship. Even with all of these precautions accidents may happen, and emergency dams are provided at the head of each flight of locks, consisting of swing bridges, which can be thrown across the locks in case of an accident which makes a connection between the top level and the level below; wicket girders are let down from these swing bridges, supported by a sill at the bottom and the horizontal truss work of the bridge at the top. These wicket girders act as runways for gates, which are lowered and gradually stop the flow. It will not be out of place at this point to give consideration in a general way to the question of adequacy of the water supply to maintain a large commerce through the locks. Data bearing on the subject have been collected for many years and studied with care. During eight or nine months of the year there is more than a sufficient supply for all purposes, but during the other four or three months there is practically none, and it becomes necessary to store a sufficient quantity during the rainy season to supply the needs during the dry season. The enormous reservoir of Gatun Lake is available for this purpose. The bottom of the canal in the summit level is at a reference 40, and it is evident that navigation, with the extreme depths provided of 40 feet in sea water, can be carried on until the surface of the lake falls to reference 81 2/3. As the water surface in the lake is to be allowed to rise to reference 87, there is stored available for the dry season a little more than five feet. Making due allowances for power consumption, evaporation, about which data are available, seepage and leakage at the gates during a dry season of minimum flow, assumed as following a wet season of minimum flow, an average of 41 passages of the canal per day is possible, using the full length of lock. In the average dry season 58 complete transits of the canal are possible, or a greater number than the 24 hours of the day would permit, allowing vessels to follow each other at intervals of one hour. With the design for the locks as adopted a certain amount of water can be saved at each lockage whenever a vessel does not draw the full permissible depth of 40 feet feet by cross-filling or emptying through the middle wall. As a consequence it can be stated that there will be sufficient water for as many lockages as the time in the day will permit. At Gatun three locks in flight overcome the difference in level between the lake and sea, and are being constructed in a cutting made through a hill. The excavation, consisting of upwards of 5,000,000 cubic yards, mostly rock, is practically completed. the locks are of concrete, and contain about 2,046,100 cubic yards of this material. On January 1 last they were 49 per cent completed. The broken stone for the concrete is quarried and transported from Porto Bello, about 20 miles east of Colon, and the sand is procured from Nombre de Dios, about 20 miles farther to the east. Both are transported direct to Gatun in barges through the French Canal, which was dredged of rock ledges and accumulated deposits for the purpose. Since the canal line was cut through to the French Canal this new channel is also used. The cement is purchased under contract at docks in jersey City and shipped to Cristobal, thence by barges to Gatun or cars to Pedro Miguel and Miraflores. The material taken to Gatun in barges is landed at unloading docks, conveniently located on the old east diversion, to which a channel from the French Canal was excavated by dredges. The east dock is inclosed, forming the cement storehouse. Its floor dimensions are 106 feet by 490 feet. The roof projects 35 feet beyond the face of the dock, affording some protection against the rains. The building is divided into ten bays, in each of which a two-ton travelling crane, worked by electric motors, operate entirely across the building. In the rear of the building 30 cement hoppers are placed in the floors and covered with steel screens. The cement is delivered through these hoppers into cars running on a track below the floor. The cement for this work is in barrels, which are first put into the storehouse and subsequently moved to the hoppers. Grab buckets, operated by cableways, remove the sand and stone from the barges, moored against the west dock, and deliver the materials in stock piles. The towers of the cableways are of steel, 85 feet high and 800 feet apart. They are mounted on cars, which enable movement at right angles to the line of the cable; one single and two duplex cableways are provided. (See illustration) Each of the latter have complete independent cableway systems. The cableways are equipped with five 70 cubic feet self-digging grab buckets, each having an independent run from the barge to the stock pile. The cableways have not the capacity to unload the material required with sufficient rapidity, and have been augmented by three derricks operating on a dock north of the cement shed, transferring sand and stone to bins. Two tunnels run north and south through the stock piles, with hoppers in the top through which stone and sand are fed to cars. Cement, sand, and stone are transported to the mixers by a double-track electric railway, originally designed on the third-rail system, but subsequently changed to the overhead trolley. The road runs under the cement shed, then single track through each tunnel under the sand and stone piles, joining after leaving the tunnels and extending to the mixer house, through which a single track runs over the hoppers, feeding the mixers; thence double track back to the cement shed. The gauge is 24 inches. The cars used for transferring the material are of steel with hinged side doors, and bottoms inclined outward at an angle of 52 degrees from the horizontal. A steel partition divides each car into compartments, one for rock and cement and one for sand. The car starts at the cement shed, where it receives two barrels of cement, thence runs through one of the tunnels, receiving a full charge of stone and sand in the proper compartment, and proceeds to deliver this load in the mixer hopper. The concrete mixers are of the cubical type, each having a capacity of 64 cubic feet. There are eight of them, all mounted in one building on the west side of the lock site, arranged so that four dump in one direction and the other four directly opposite, thus permitting the use of two tracks under the mixers. There is, however, but one track above. A four-track electric railway, third-rail system, operates the length of the locks and carries the concrete from the mixers to the cableways over the locks, by which it is placed. The equipment for this road consists of 12 electric four wheel mine-locomotive-type engines and 24 flat cars fitted with automatic couplers, each designed to carry a two-yard concrete bucket. Two charges of concrete are taken by each train and carried to the cableways. Four duplex cableways span the locks with steel towers 85 feet high and 800 feet apart, similar in design to the unloading cableways. The forms used in concrete laying are of steel and, for the straight portion of the walls, so designed as to permit construction of monoliths 36 feet in length extending from the floor to the top of the walls. The forms for the main and the lateral culverts are of steel and are collapsible. This plant is operated 12 hours per day, and has been augmented by an auxiliary plant containing two two-yard concrete mixers, to which the materials are supplied by train service through hoppers. The channel from the locks to deep water in Limon Bay, approximately seven miles in length, is being excavated in part by steam shovels and the remainder by dredges. South of the French Canal the Mindi Hills cross the line of our canal between Gatun and Limon Bay, rising to the elevations 50 and 60. As the bulk of the excavation is rock, steam shovels were put to work to secure the requisite width and depth. It was thought that when sea-level was reached the shovels would have to be replaced by dredges, as the Mindi River is within a few hundred yards of the area, and the French Canal borders it. As the work progressed, however, notwithstanding the seamy nature of the rock, it was found that a relatively narrow levee would keep out water from the French Canal, and the seepage was so small as to be easily handled by pumps. One shovel-cut to grade was made, when the high water in December, 1909, flooded the pit and work was suspended until recently, when the soft material was removed by a suction dredge. The water is being pumped from the pit so as to permit completion of the work by steam shovels. Over the area to be dredged, a sea-going suction dredge removes the softer material, while ladder and dipper dredges handle the rock and still clays. The underlying rock is drilled and blasted prior to dredging. A total of over 35,000,000 cubic yards was the estimated amount to be excavated, of which 60.3 per cent is completed. 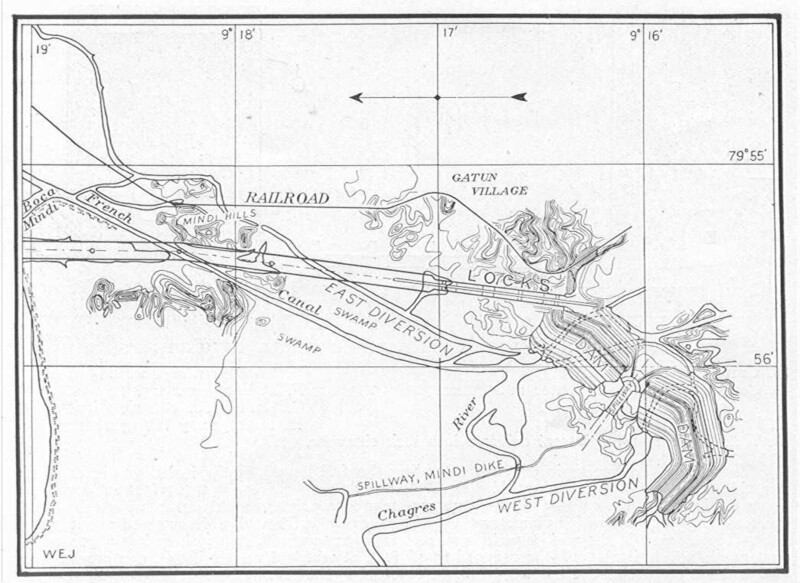 In the Pacific Division the work consists of the construction of duplicate locks at Pedro Miguel overcoming a 30-foot difference of level, with the necessary dams; two locks in flight, also in duplicate, at Miraflores, connected with the adjacent hills by one earth and one concrete dam; excavating the channels and the excavation of the channel to proper width and depth to deep water in the Pacific. The Pedro Miguel locks connect the summit or 85-foot level with the 55-foot level. The excavation for the locks, amounting to 770,000 cubic yards, is completed, and of the 837,400 cubic yards of concrete required for their construction, 57 per cent is completed. The west dam connects the head of the locks with the hills to the northwest and performs the same function at the south end of the lake that the Gatun dam does at the north. It is to be of earth, about 1,400 feet long, 40 feet wide at the top, which will be at reference 107 above mean tide, and have side slopes of 8:1. It will be subjected to a maximum head of 40 feet, though the average head is from 25 to 30 feet. In its construction two rock piles are formed; between these two masses of material (from which an existing stratum of gravel was removed), selected material will be placed properly puddled and rolled. This central portion will have a thickness of 140 feet at the bottom. Concrete core walls will connect the dam with the hill and lock. The dam which contains about 1,000,000 cubic yards, is 26 per cent completed. The natural surface of the ground from the east wall to an adjacent hill is above the upper level, but it is to some extent pervious to water. To cut off any possible flow, the lock wall is returned toward the hill, with which it will be connected by a concrete core wall. The Miraflores locks are two in flight, overcoming the difference in level between Miraflores Lake, whose surface is at reference 55, and the sea-level section. As the fluctuations in tide are about 20 feet and mean tide is the datum, it will be noted that the maximum lift for these locks is about 65 feet. The excavation for the upper set of locks is complete and for the lower set it is about 70 per cent complete. It was not intended to lay any concrete until the plant at Pedro Miguel had finished the locks at that locality; but, as the work as advanced so much more rapidly than anticipated, and as the contractors are to complete the erection of the gates seven months earlier than expected, it became necessary to install auxiliary mixers and begin this part of the work earlier. There will be a total of 1,312,200 cubic yards of concrete to lay for these locks, of which 7 per cent is already done. The Cocoli River, a tributary of the Rio Grande, crosses the site of the Miraflores locks from the west, and is such a formidable stream in times of heavy freshets that the protection of the locks against its floods during construction and after completion is necessary. A diversion channel through the hills to the west with a dam across the river valley would accomplish the desired end; but, as a dam at the head of and to the west of the locks is also necessary to impound the water for the pool above, the solution finally adopted was the construction of a dam extending from the head of the locks to Cocoli Hill, with a direction nearly parallel to the axis of the locks. By this arrangement the Cocoli River will discharge into the upper pool. The dam is of earth, 2,300 feet long, top width 40 feet at reference 70, and the side slopes approximately 12:1. The average head to which the dam will be subjected is 30 feet, the maximum 40 feet. It is being constructed like the Gatun dam, and is 43 per cent complete. The east dam will be of concrete, approximately 500 feet long, provided with regulating works similar to and of the same dimensions as those at Gatun, the crest of this instance being at elevation 39, with seven openings, permitting a discharge of 7,500 cubic feet per second. The broken stone for the concrete in the locks on the Pacific side is obtained from a quarry established on the west side of Ancon Hill. The material is transferred from the crushers to bins and then carried to stock piles at the lock sites by rail. Sand is obtained from an extensive sand-bank at Chamé, 23 miles west of Balboa. Sand is brought in barges, into which it is loaded by a ladder dredge, transferred to bins by electric cranes, and thence hauled to the stock piles by rail. The storage piles for Pedro Miguel are above the lock site on the bottom of the top level, or elevation 40. Two trestles are run out by a switchback from the west side of the lock, from which the cars dump their load, sand on one side, stone on the other. Storage capacity is provided for one-fifth of the total amount of material required for the locks. At Miraflores the stock piles are on either side of the lock site, and the materials are also dumped from trestles, storage capacity being approximately one-third of the total amount required from the locks. The construction plant was designed for Miraflores locks and then adapted for use at Pedro Miguel, and consists of eight cantilever cranes built of steel throughout. Four of the cranes operate in the lock chambers, designated chamber cranes, and four will operate at Miraflores from the top of the side banks or berms of the lock-pit, and are called berm cranes. At Pedro Miguel the configuration of the ground on the sides prevents the use of berm cranes in laying concrete in the walls, which are therefore being built by the chamber cranes alone. Two of the berm cranes operate in the storage yard. Each berm crane consists of a tower mounted on trucks running on two tracks 50 feet apart, center to center, with a fixed cantilever on one side 150 feet in length. On the other side of the tower is a boom 144 feet long, so hinged that it has motion in a vertical plane from 10 degrees above the horizontal to 15 degrees below. The operating machinery for both types of cranes is in an enclosed structure on top of the towers. Motion along the tracks is given through a pull on a cable fixed at its end. For use at Pedro Miguel, the booms of the berm cranes are removed and replaced by cantilevers from the other two cranes, thus making two towers with fixed cantilevers on either side. At the bottom of each tower are two two-yard cubical concrete mixers, which are fed from hoppers above. Hoppers for sand and stone are arranged with sufficient capacity for holding material for 10 yards of concrete. Below these hoppers are measuring hoppers, which feed directly into the mixers and receive their supply from the storage hoppers above. Cement delivered in bags is transferred directly from the cars to a platform above the measuring or mixer hoppers. The chamber cranes are mounted by trucks on tracks placed 60 feet center to center, along which the crane moves in the same way as the berm crane. Two fixed arms project from the towers, one extending out 87 feet 6 inches and the other 59 feet 6 inches. These cranes are laying concrete in the walls of the Pedro Miguel locks as well as placing the forms, which are of wood and of the cantilever type. The mixers deliver the concrete to buckets on cars, two cars to the train, pulled by a 12-ton construction locomotive, operating on a 3-foot-gauge track laid on an incline to the floor of the locks. On both the berm and chamber cranes the operator is directly over the bucket and attends to delivering the material in place. In the Miraflores locks the chamber cranes will place the forms and, receiving concrete by means of a specially designed hopper from the berm cranes, will place it in the center wall. The term cranes will operate with the fixed cantilever from the stock piles supplying the mixers, the boom taking the product and placing it in the outer walls. This plant is operated eight hours per day. For a distance of one and one-half miles south from the Miraflores locks rock is found in the channel, to be excavated at an average elevation of minus 30. The estimated quantity to be removed is 1,503,260 cubic yards, which is covered by 8,158,133 cubic yards of alluvial material, averaging 38 feet in depth. It was not practicable to remove the earth and rock by dredging and subaqueous methods, as the requisite plant could not have been assembled to complete the work in the allotted time. An hydraulic excavating plant was therefore selected as being the cheapest and most expeditious method of handling the loam, especially because by this means 450 acres of swamp land adjacent to the canal be be reclaimed. Four hydraulic pumps force water through pipes, fitted with hydraulic giants or monitors, with a pressure of 130 pounds per square inch at the nozzles. These jets wash the loam to sumps, from which 18-inch centrifugal dredging pumps, mounted on reinforced concrete barges, pump the material to such places as may be desired. Below the area to be excavated in this matter, the channel is secured by ordinary dredging operations. Rock encountered is blasted, the drilling being done by churn drills through the natural surface to the proper depth, or, where submerged, by use of a drill scow. A Lobnitz rock breaker is also in use for preparing the rock for the dredges. The total amount of material to be excavated aggregates 35,000,000 cubic yards, of which 73.55 per cent is completed. The relocated Panama Railroad is being pushed forward so as to keep pace with canal construction work. From Colon to Mindi and from Corozal to Panama, the old line, relieved of some of its curvature, will be used, but the remainder must be rebuilt. From Mindi to Gatun, two miles, and from Paraiso to Corozal, four miles, the new line is completed and is being operated. Just south of Miraflores the new road passes through a tunnel 800 feet long. The section from Frijoles to Gamboa, 9 miles, is complete to grade and has been turned over to the Central Division for use in wasting material. This includes a steel bridge across the Chagres nearly one-quarter of a mile long. From Gatun to Frijoles a temporary line was completed up to grade 60 in April, 1910, and maintained ready for operation at any time during the past wet season that the old line was flooded out. About 3,000,000 cubic yards are still required to complete the embankments of this section to elevation 95, and every effort is being made to finish the entire line to Gamboa, 31 miles, to full grade by January 1, 1912. On this date it is expected that work in the Gatun spillway will have progressed sufficiently to begin raising the lake to elevation 55. 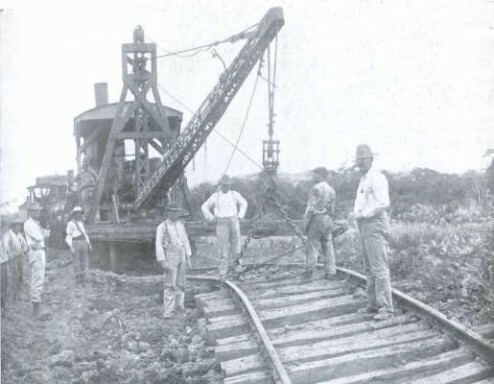 Construction of the line from Gamboa to Paraiso, east of the cut, was started in January and will be pushed with a view to completion by January 1, 1912, if possible. As the greater part of the road passes through the lake, reinforced concrete culverts are provided to equalize the water on both sides of the embankments. Under the Spooner Act the President was authorize to construct a canal through a commission consisting of seven members. In January, 1905, the Secretary of War, in a letter to the President, called attention to this faulty organization. In 1907 the President simplified matters by combining the duties of Chairman and Chief Engineer in one person, and later the Secretary of War vested the powers of the Governor of the Canal Zone in the same party, thus eliminating the friction that had previously existed between these three functionaries. Authority was still further concentrated by an Executive order in January, 1908, and because of which the present organization resulted. The Chief Engineer's office is divided into three divisions. The first has charge of designs of masonry and lock structures, including valves, lock gates, and protective devices, operating machinery, movable dams, and spillway. The second has charge of all questions that may arise concerning shops, buildings, municipal improvements, estimates, allotment of funds, rates of pay, and cost-keeping The third has charge of meteorology, river hydraulics, general surveys not pertaining to any of the construction divisions, and special investigations. Reporting directly to the Chairman are the heads of the Departments of Sanitation, Civil Administration, law, Examination of Accounts, Disbursements, the Quartermaster's and Subsistence Departments, and the Purchasing Department in the United States. The Department of Sanitation has charge of the hospitals, quarantine, oiling of pools, and prescribes to the Quartermaster's Department the areas for grass and brush cutting outside of the terminal cities and the adjacent settlementsAncon and Cristobal. Whatever drainage or ditching is to be done is first planned by this department, and, after approval by the Chairman, is executed by that construction division within the territorial limits of which the work lies. The work of the Department of Civil Administration is divided among the divisions of Posts, Customs and Revenues, Police and Prisons, Schools, Fire Protection, and Public Works; the offices of Prosecuting Attorney, Treasurer, and Auditor of the Canal Zone, and the Judiciary. This last includes the Supreme, Circuit, and District courts of the Zone. The head of the the department represents the Commission in most matters that arise between the Canal Zone and the republic of Panama. The Department of Law, in charge of the Counsel and Chief Attorney of the Commission, handles all legal matters and land affairs of the Commission and railroad. The Examiner of Accounts has charge of the general books of the Commission; classifies all expenditures; handles the accounting for coupon books and meal tickets; examines claims presented for payment and prepares the proper vouchers; makes a monthly administrative examination of the disbursing officer's accounts, and counts the cash in the disbursing officer's hands every six months; inspects the books and accounts of all employees handling money and coupon books; checks all pay-rolls; examines and checks daily the time-books of all hourly employees; reports misuse of property and violation of rules and regulations in connection with the efficient and economical application of labor and material; handles employees' injury claims, and audits accounts of all revenue officers. Th Quartermaster's Department performs all duties in connection with the recruiting of laborers; the housing of employees; the constructions, repair and furnishing of all buildings; the distribution of fuel, distilled or sterilized water, and commissaries to the employees; the removal and destruction of garbage and night soil; the cutting of grass and brush for the Sanitary Department; the requisitioning of all material and supplies to be purchased in the Untied States, except subsistence supplies; the purchase of material on the isthmus; the custody and issuance of all material and supplies from store-houses, and the supplying of animal transportation. The Subsistence Department has charge of and operates all the hotels, messes, and kitchens on the Isthmus. The head of the department is also the Commissary of the Panama Railroad Company, and as such requisitions for or purchases all supplies handled by the commissaries on the Isthmus, and operates the cold storage and manufacturing plants. The General Purchasing Officer is in charge of the Washington office of the Commission. he makes all purchases and inspections of material in the Untied States requisition by the Quartermaster's Department, and recruits employees for all vacancies in the "gold" personnel on the Isthmus. The office of the Secretary of the Commission and the Panama Railroad are also under the Chairmanthe latter by reason of his position as President of the railroad company. The Secretary of the Commission edits the "Canal Record," handles requests for information regarding matters in connection with the canal work, and hears and investigates grievances of employees. Generally speaking, employees are selected on account of their special fitness for the work in hand, and are then unhampered in their methods of securing definite results, thus bringing out to its fullest extent individual effort and brain power. As a consequence each man has a personal interest in the work and seems imbued with the idea that the success of the enterprise depends on him. the spirit of enthusiasm and of loyalty among the canal workers strikes forcibly every one who visits the Isthmus, and convinces the doubting that the canal will be built. The time required for completing the lock type of canal was estimated by the Board of 1905, which made its report in January, 1906, at nine years, in accordance with which the work should be completed by January 1, 1915, and this is still retained as the date for the official opening. the expectation that the locks will be completed by June 1, 1913, is dependent on the gate contract and has already been noted, which leaves Culebra Cut as the doubtful factor. Assuming that all the material will slide into the cut that was estimated in June last, so that all of it will have to be removed, it is estimated that this part of the cut will be finished by September 1, 1913. It is well within possibilityindeed, it is probablethat other slides or breaks will develop, and it may be more economical to admit the water, thus getting the advantage of the back pressure, and remove the remainder by dredges, which will then be available and which can be passed through the locks when completed. This will be done if need be; but in any event there is nothing that can be foreseen at present which will postpone the date fixed for the official opening, with ample time to spare for turning up the operating machinery and to organize and train a force for the operation and maintenance of the canal by January 1, 1915. With concrete work in the locks coming to a close in the early part of 1912, steps must be taken to disband the present organization. The time has arrived for outlining an organization for the operation and maintenance of the canal. The tuning up of the machinery and the training of an organization will require the actual of the canal. It is stated on reliable authority that at least 18 months will be required for shipping to adjust itself to the new conditions that will exist when the canal is ready for use. Such readjustment, however, will not be attempted until some definite announcement is made of the tolls that are to be charged and the basis for such tolls. Much has been said and predicted as the commercial value of the canal to the United States. In this connection it must be remembered that the commercial shipping of this country never required the canal. the trip of the Oregon in 1898 settled the question of the advisability of constructing an Isthmian Canal, and had the canal been built at that time, thereby saving that trip around the Horn, there is no question tat it would have been agreed generally that the canal, even at an expenditure of $375,000,000 was worth while. In whatever light the Panama Canal is viewed, it will have paid for itself if in time of war or threatened war a concentration of the fleet is effected without that long, tedious, uncertain route followed by the Oregon. It will practically double the efficiency of the fleet, and notwithstanding the fact that we are a peaceful nation, our outlying possessions make the Panama Canal a military necessity, and it must be so recognized. From that pint of view the debt should be charged to the account which necessitated its construction, and whatever revenues are derived from other sources are so much to the god. The traffic that will utilize the canal depends upon the tolls that will be charged, and the President has asked the Congress for legislation which will enable the establishment of rates. There is another policy which if adopted will have a material bearing on the revenues of the enterprise. Through the Panama Railroad a large expenditure of money has been made for providing the present working forces with supplies of all kinds. Though the railroad has been reimbursed for this plant through fixed charges on sales, it should not be abandoned, but utilized for furnishing shipping with its needed supplies. Suitable coaling plants should be erected for the sale of coal to vessels touching at or passing through the canal. In addition, since oil is now used on a number of ships plying in the Pacific, such fuel should also be on hand for sale by the canal authorities. The extensive machine shops now located at Gorgona must be moved before the completion of the canal, and they should be established in connection with a dry dock that will be needed for commercial purposes, and utilized as revenue producer for the canal. This policy also needs congressional action. With properly regulated tools, and with facilities for fully equipping, supplying, and repairing ships, the Panama route would offer many advantages and bring to it a sufficiently remunerative return to pay not only the operating expenses, but to gradually absorb the debt which the United States has incurred by its construction.